Toyark Forum member Goldengreg brings us word that a company called Dreams Come True will be producing a cool crossover set of toys. 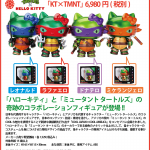 They are taking the iconic Hello Kitty and dressing it up as the Teenage Mutant Ninja Turtles. This is part of their Cool Japan X Cool America series. The will stand a little over 5.5 inches tall. Each one will sell for 6,980 Yen (about $69 USD) and will be limited to just 1,000 pieces for each character. Read on to see the figures.